So-after a weekend of whirlwind bike shopping, theatre going and jug band festival attending, we sent Andy off to work riding his shiny new bicycle. 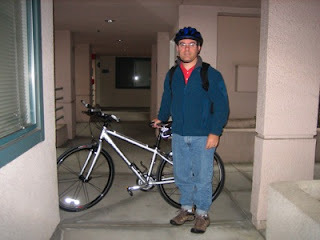 Mr. Steingruebl is officially a bicycle commuter! Wahoo! From our current, temporary, housing the trip seems to take between 10-15 minutes door-to-door. That’s faster than the car, and better for the planet! We’re all pretty excited about the new commuting mode. Our weekend was pretty busy. After bicycle shopping, we loaded up the car and drove to Mill Valley to see the Breindels. Technically, we only saw Adam since Zach was in bed and Sara was already at the theatre. We left Elise happily playing with Adam while we drove into San Francisco to see the closing night of Sara’s play. (Not technically ~hers~ but since she was in it we think of it as hers.) The play was a blast! And it was amazing to be out for an evening. We were zombies by the time we made it back to the Breindel homestead to sleep, but wow was it fun. The next morning, Sara still had theatre duties so we went out to breakfast with Adam and a very tired Zach. Later we found out that Zach was so out of it because he was sick-poor little guy. To add even more excitement to our already full weekend, we drove back to SF to attend a jug band festival. Given how tired we were and how little sunscreen we had with us, we weren’t able to stay long. However, Elise got in some good dancing and we met some nice people. (Mostly after Elise had thrown gravel on them, but apologies can make ok introductions...) There’s another festival around here someplace at the end of September, so we’ll be looking into that. When we got back to San Jose, we stopped off at Target to get supplies for darkening Elise’s room. Our suspicion was that she’d been sleeping poorly because the mini-blinds weren’t keeping out the glare from the security light by our font door. Here’s her bedroom window now-as covered by a fish shower curtain and butterfly beach towel.